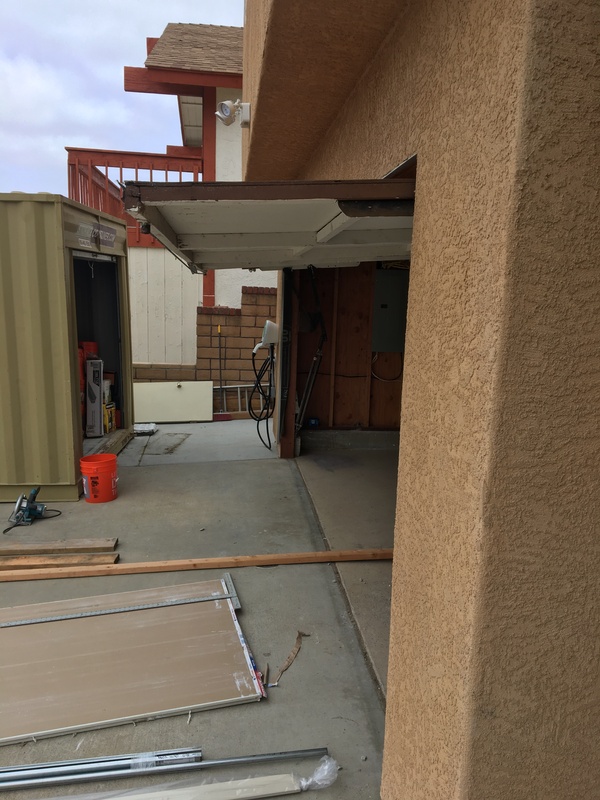 I had been thinking that installing the garage door would be one of the last things on my list because I didn’t want to have to put drywall in and around all of the various hangers and fixtures that are a necessary part of the installation. However, putting in the door now would help finish off the exterior, and let’s face it, the old garage door was looking especially sad in the context of all of the other new work. Another reason was that the door was a swing-out slab, and when it was open, the bottom stuck out and was a head-strike hazard because of the way I changed my sidewalk. So, it was really time for it to go. One last look at the old garage door. It lasted a long time, but it needed a reboot. 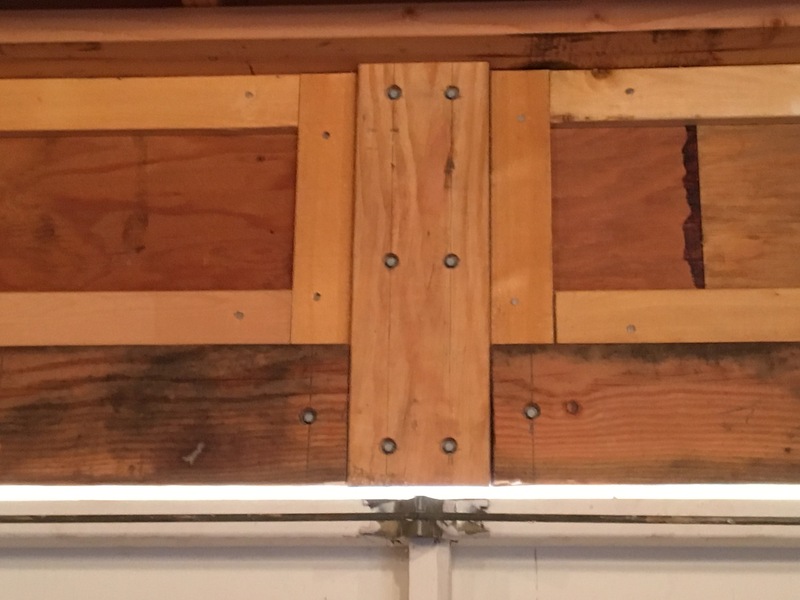 I discussed this possibility with one of my co-workers (who also happens to help me when I need an extra pair of hands), and he told me that garage door installation was pretty straightforward. He had done several, but also cautioned that you needed two people to put the sections in place. Plus, he said he would help me out when the time came. I was sold. 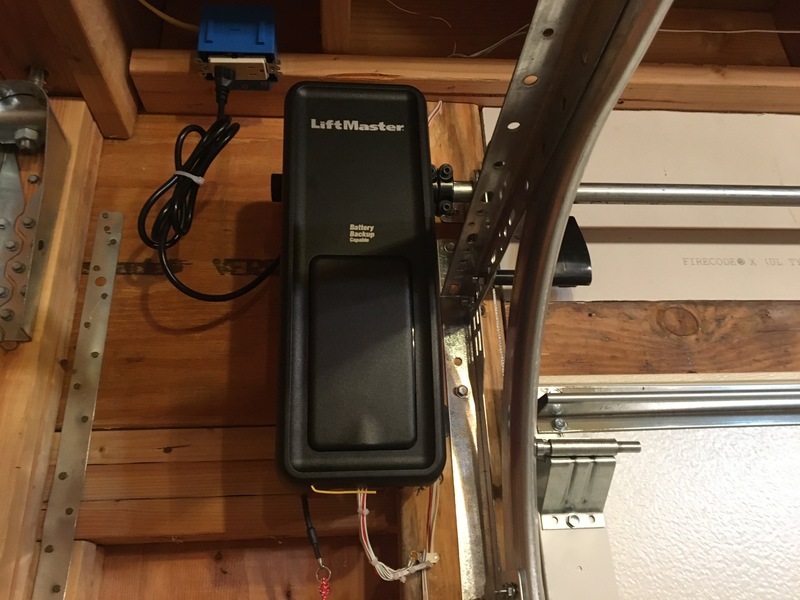 Putting in a new garage door and opener is well within the capability of the DIY’er who has a reasonable amount of experience. Having said that, you really need to respect the loads and forces that will be involved. That means that you need to do your homework and read the installation instructions and watch a few YouTube videos on how to do the installation. It’s also important to understand how the entire contraption works, which parts do what, and why you are assembling them in a certain way and sequence. Back to the job at hand. 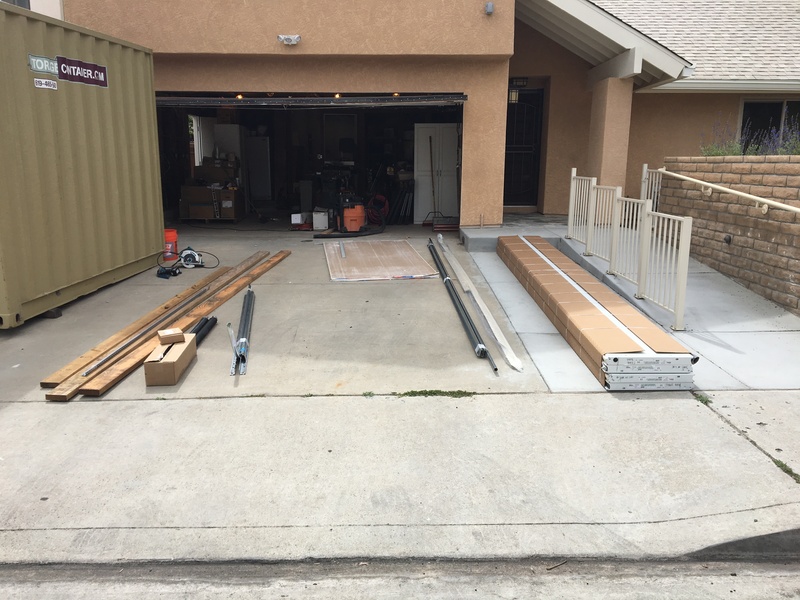 I got online and found a few places that deliver made-to-order garage door “kits”. 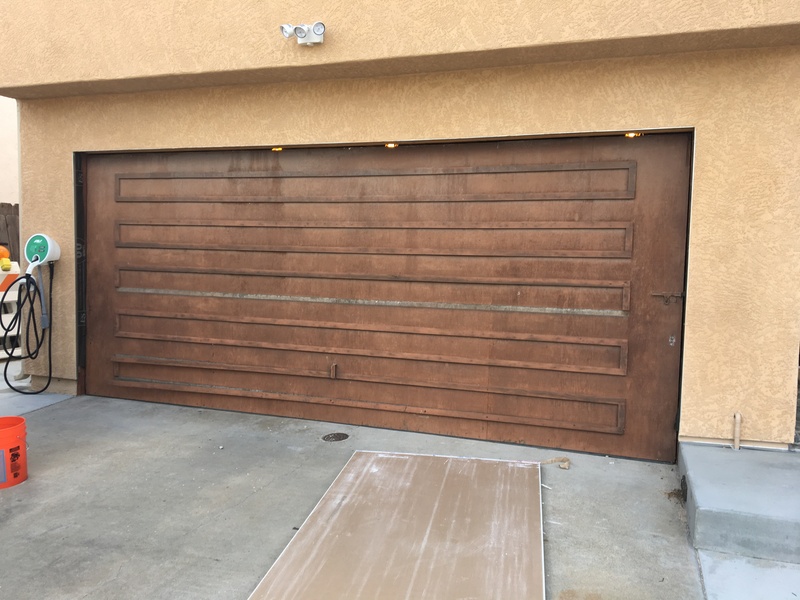 It turns out that you can get these same garage doors from dealers and installers as well as big box stores (Home Depot, Lowe’s, Costco). Two of the popular manufactures are Clopay and Amarr. I chose Amarr because I liked the available styles and options. There was a 3-4 week lead time for delivery, so I placed the order and began scheming and plotting the installation. This included downloading and careful study of the installation instructions. Read the instructions! Note that I’ve highlighted the specific sections that were applicable to my installation. The day came for delivery and I took the entire day off because my plan was to do as much preparation work as I could before my helper came the next day. 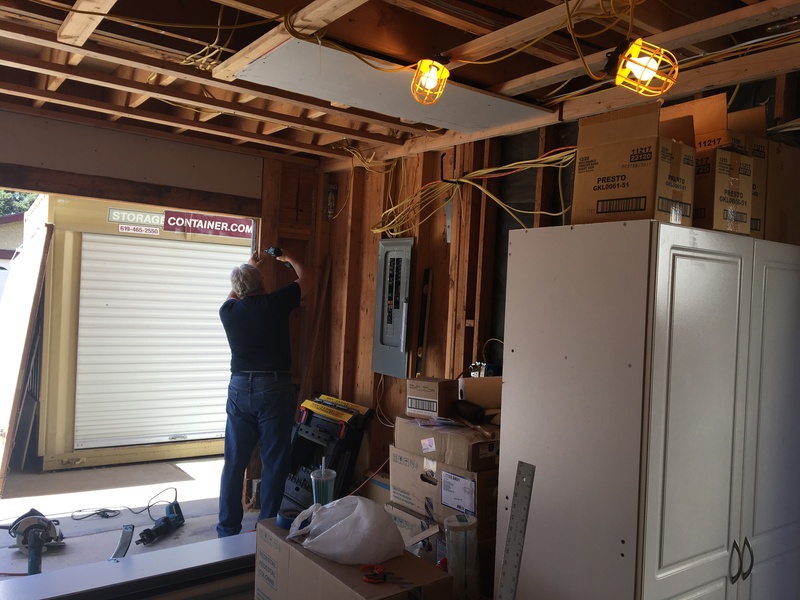 I started by cleaning up the garage (seems as that’s a constant task), and then installing some additional framing around the door opening (or “jamb”). 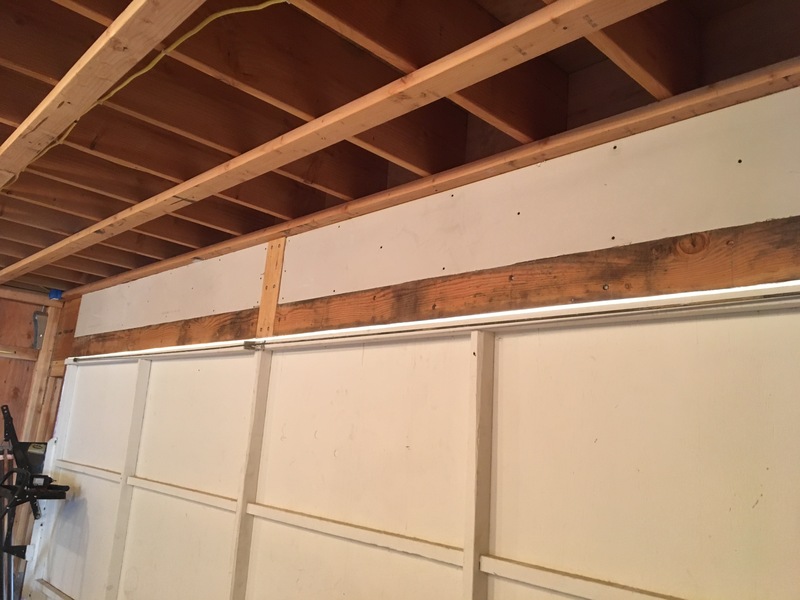 This framing is important because you’ll be attaching the tracks and the torsion spring to it, so it needs to be very solid and securely fastened to the rest of the framing. 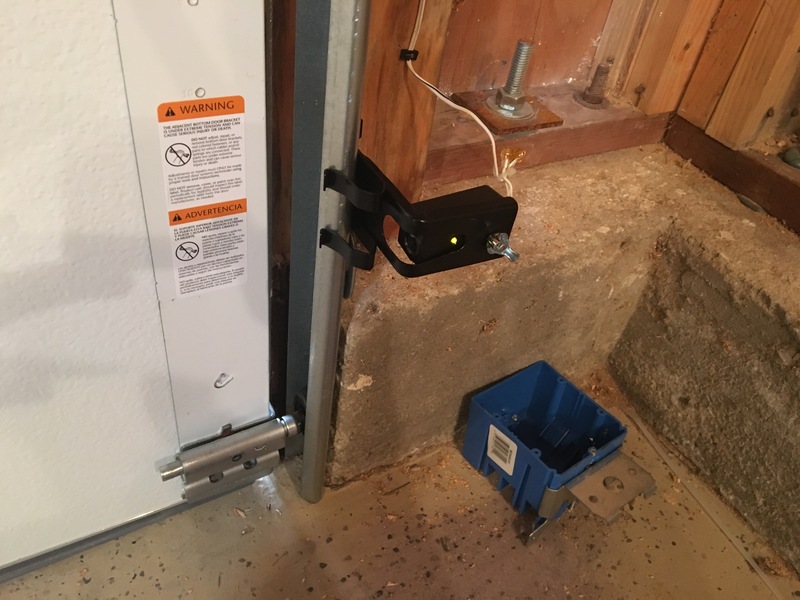 I also took the time to furr out some of the door header and pre-install sheetrock so I wouldn’t have work around the garage door parts later. 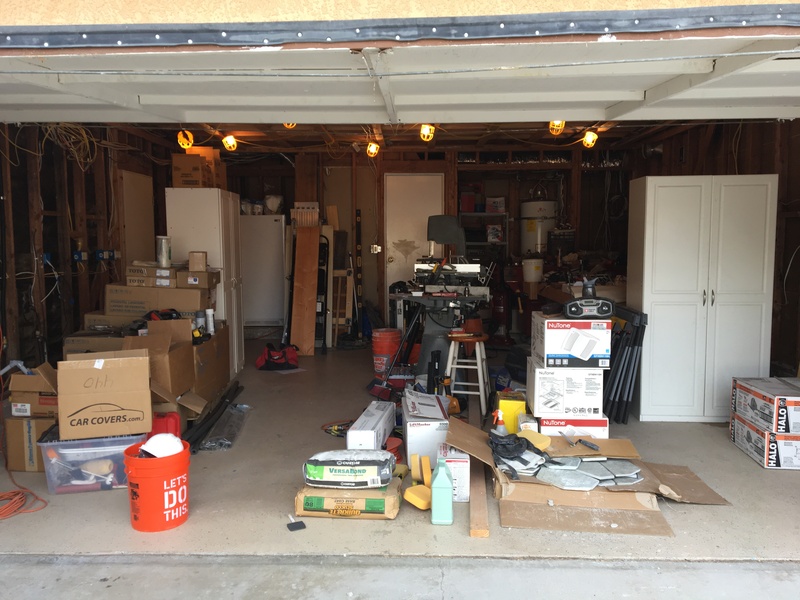 First thing is to clean up the garage so I’ll have an area to work in. Here is the new framing for the jamb. This framing needs to be sturdy because it will be taking a lot of force from the door tracks and springs. This is the torsion pad. It needs to be securely fastened to the header. I used 4-1/2″ Simpson structural wood screws (SDS). They are easier than lag bolts because to install because you don’t have to pre-drill a pilot hole. Plus they’re stronger. 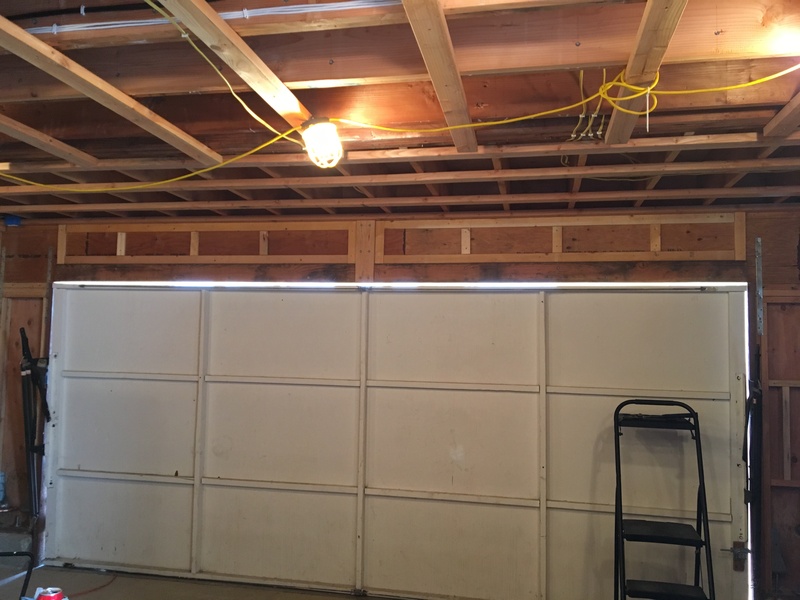 I put the sheetrock up behind where the torsion rod and spring would go to make finishing the garage easier later. My delivery truck. 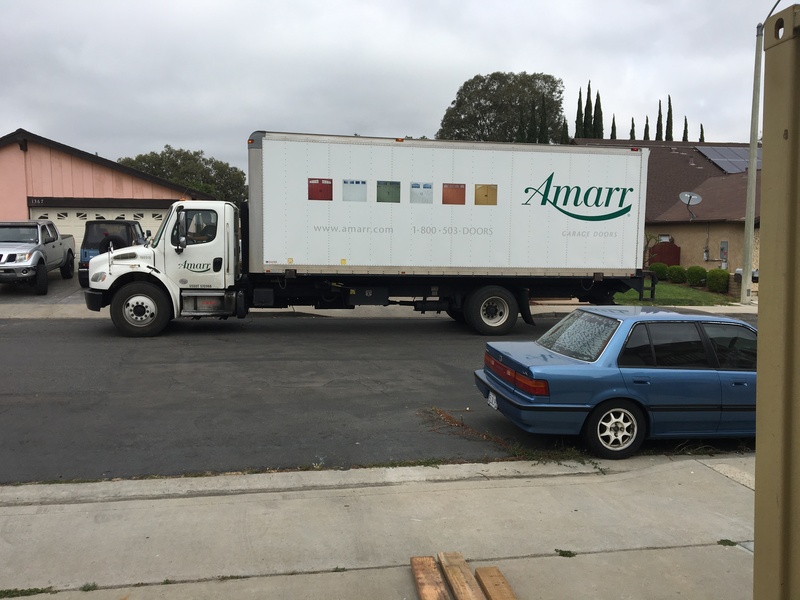 This truck had about 8 other doors kits for delivery to other homes. I guess I was in good company today. The garage door parts all delivered. The door sections are on the right and there is a big cardboard box on the lower left stuffed full of hardware. Next was the assembly of the hardware onto the individual door panels. Each panel is 16′ long by 21″ high. They’re pretty unwieldy, but one can move them around if you get in the middle and move slowly. These were much easier to handle than 20′ 2×12’s that I had to tug about when I was fixing my bedroom joists. 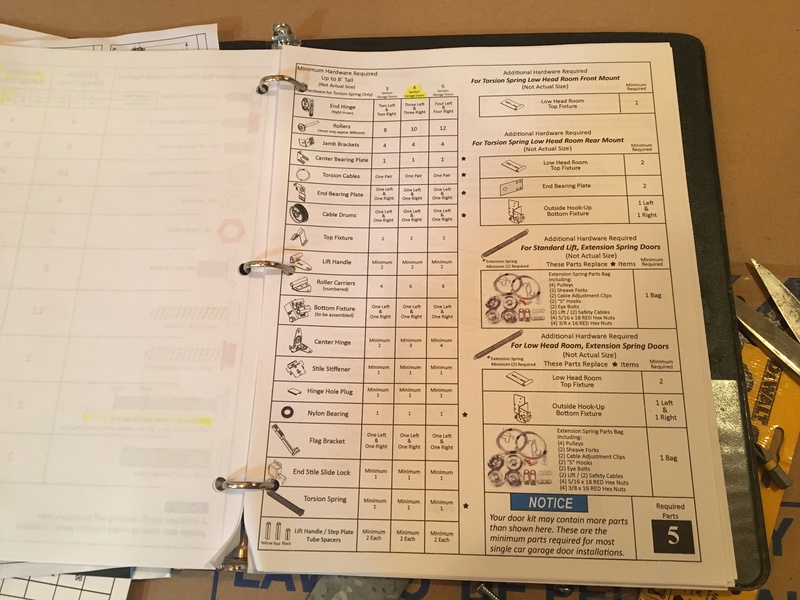 The time I spent in reviewing the instructions paid off here because I was able to quickly recognize which part was what and where it went. That’s important when you’re staring at a box of about 300 parts and you need to sort them out. It turns out that installation instructions are sometimes only so good. In this case, I had to install “struts” which are basically longitudinal reinforcements on each door panel. It was not clear from the instructions how to line up all of the holes, and, indeed, it seemed that several holes were not lining up at all. After about 30 minutes of head scratching and going to the computer to get a magnified view of the plans (thanks to PDF), I was able to figure out how it all went together and that I simply needed to drill some holes where they “should” have been. Bottom line is that sometimes you need to be a little smarter than the instructions. Door panels with hardware installed. They are stacked in in order so we can just flip them up and put them on top of one another. 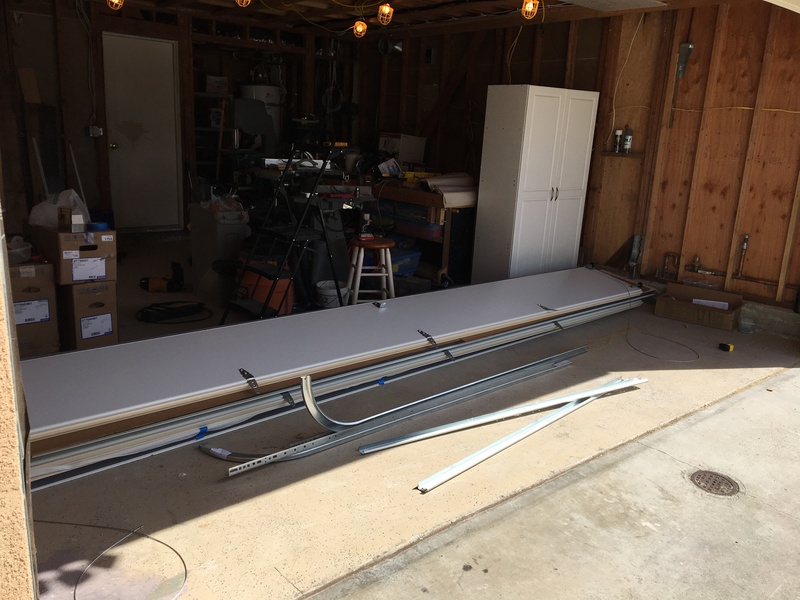 The next day, my helper came and we pulled down the old door, reconfigured the side jambs for the new door, and then commenced installation. We got the panels in place, and then I spent the entire next day putting up the tracks, installing the torsion spring and lifting mechanism, and installing the opener. Here is my colleague from work who is a very reliable helper. I couldn’t have done this project without him. Track hanger installed. I needed to do some adjustments later when I pulled up the door. This is the torsion spring. The winder is in the middle. It’s a really nice setup because you just chuck in a 3/8″ socket to your electric drill and go to town. Winding the springs was essentially effortless. Take advantage of the fact that the hardware is designed to be adjustable. 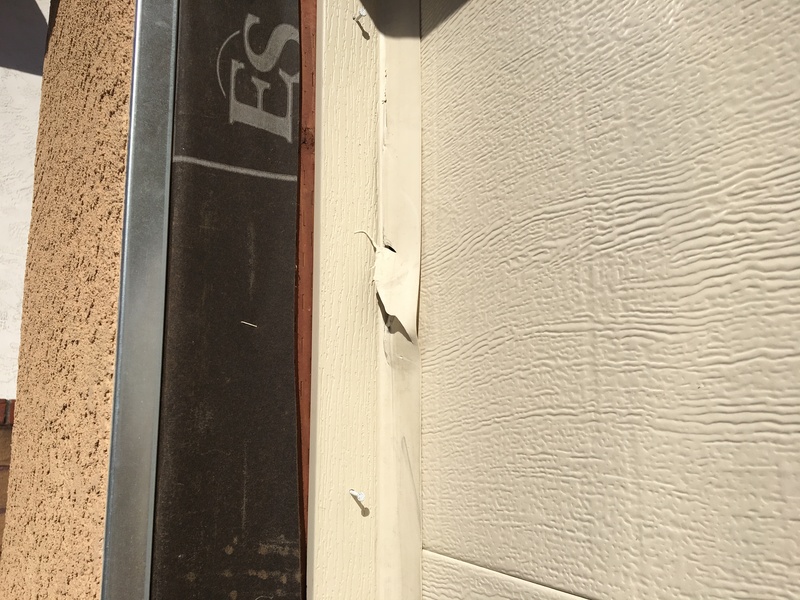 You will likely have to accommodate some degree of error in your door opening and floor in order to get the door plumb and square. The door can also operate with a certain amount of tolerance, so things don’t have to be super exact. But you want to do a good job, yes? So get things as close as you can. I had to tweak things several times after the installation was complete as I noticed that this or that didn’t align just right. Every time I made an adjustment, the door operated that much smoother. Use SDS screws in place of lag bolts if that hardware is not provided with the door. Examples include attachment of the spring pad and the rear track support hangers. 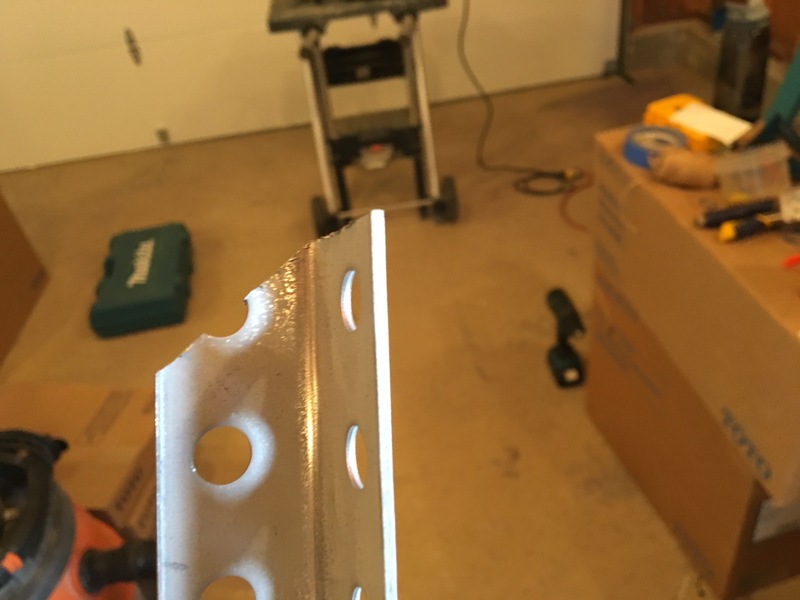 SDS screws don’t require pre-drilling and are actually stronger. Cut the top of the diagonal back hanger support at an angle so it fits flush against the drywall. 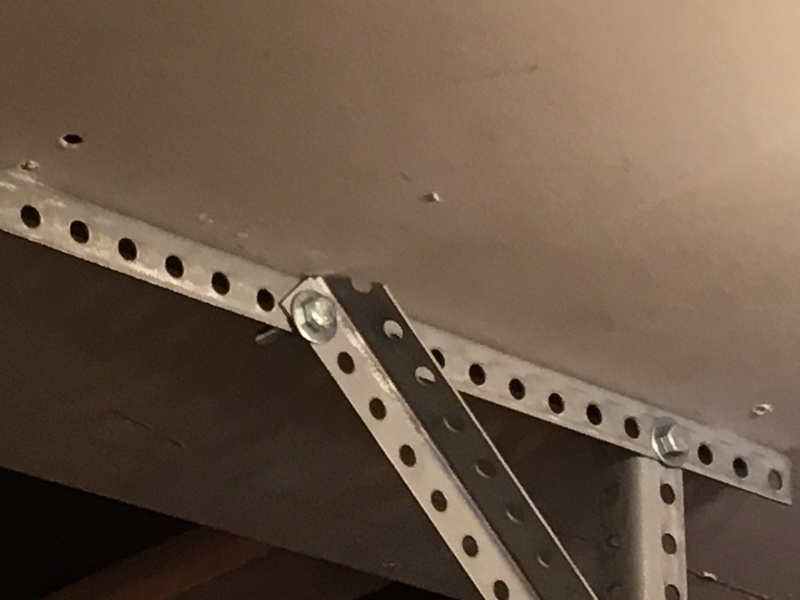 Cut the end of your track hanger brace so it lies flat on the bottom of the ceiling. Track hanger brace installed. 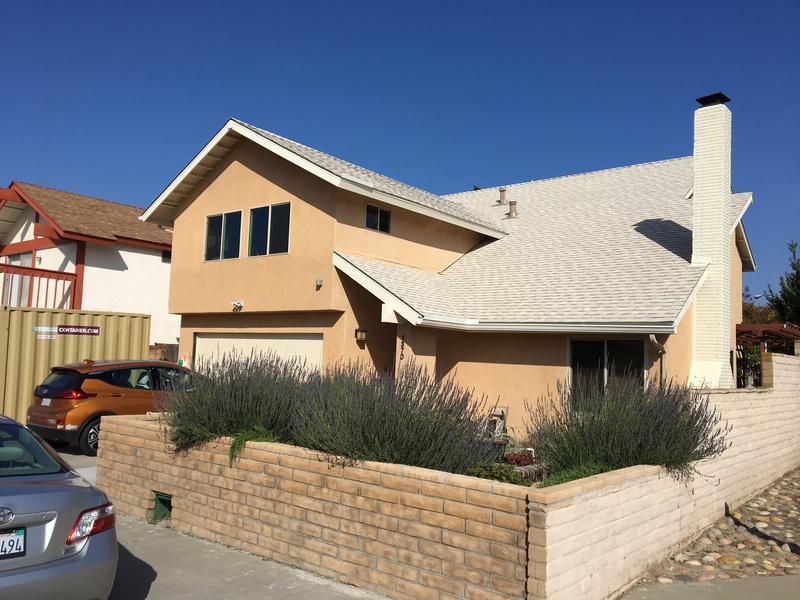 See how the top of the angle lies flat against the sheetrock? Believe me, you won’t be able to get the holes to line up if you don’t cut off that little piece. The door was misaligned a bit when I first operated it. I didn’t notice at first and ended up damaging the door seal on the right side. NBD, that’s something that’s easy to replace. 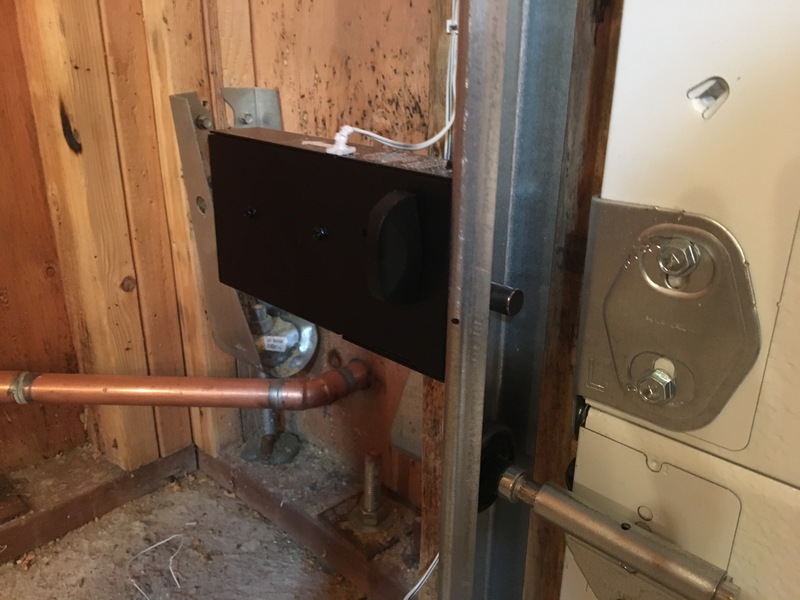 Take the time to do a neat and professional installation. This includes running the wires for the opener neatly, and hidden if you can. 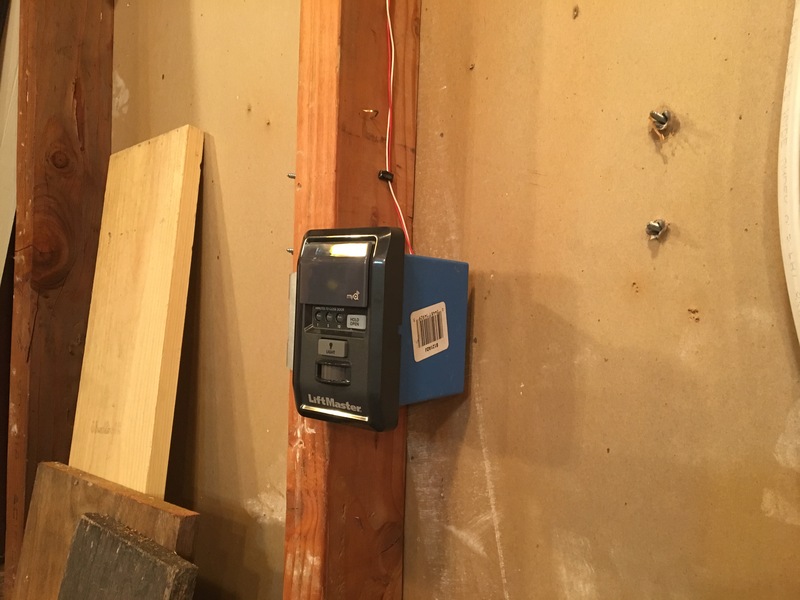 I mounted my opener button to an electrical box and ran all the wires where the would be hidden by sheetrock (eventually). These details caused me to run our of bell wire and bell wire staples (the opener didn’t come with enough material), but the effort was worth it. Don’t forget the safety stickers! Door operating switch. 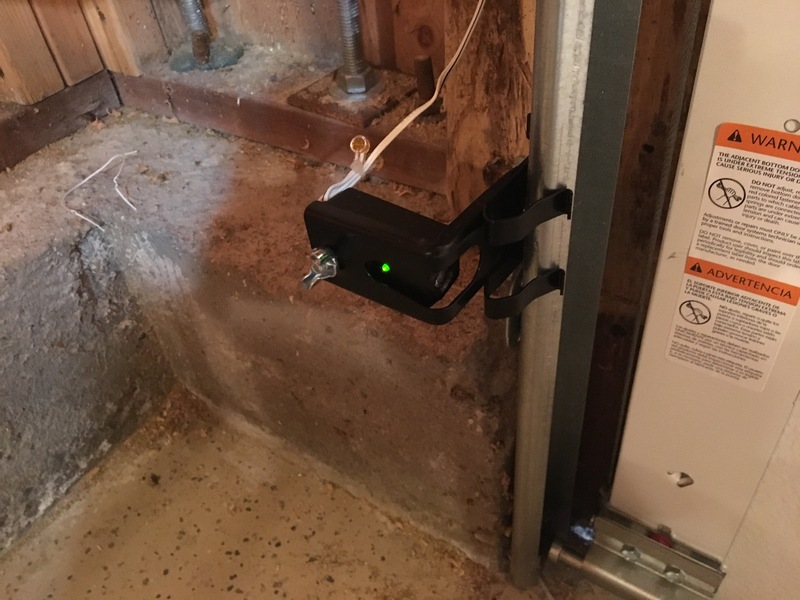 I mounted this to an electrical box so the installation is clean after the sheetrock is in place. When I do a job, I want others to think that a professional did it. 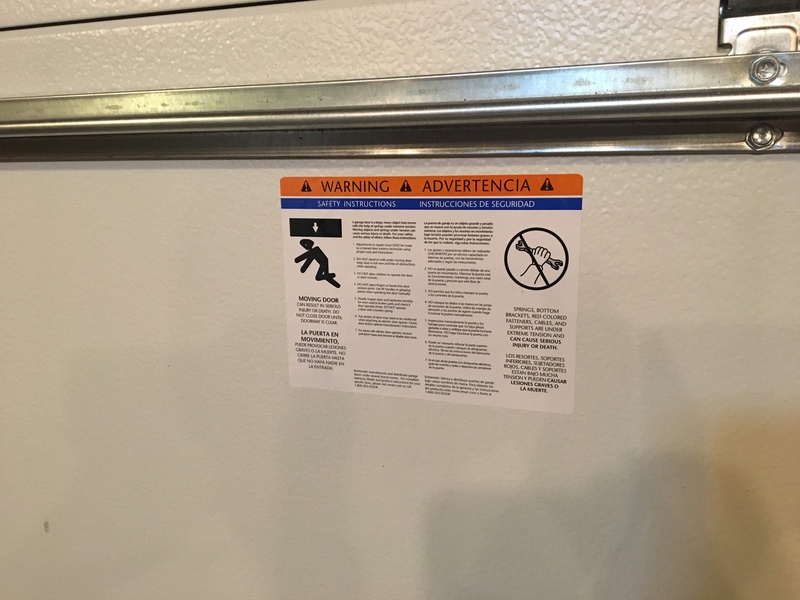 Installing the safety stickers is something that the pros do (or should do). I always sign my work. It’s a nice personal touch. My opener is really slick (Liftmaster 8500). 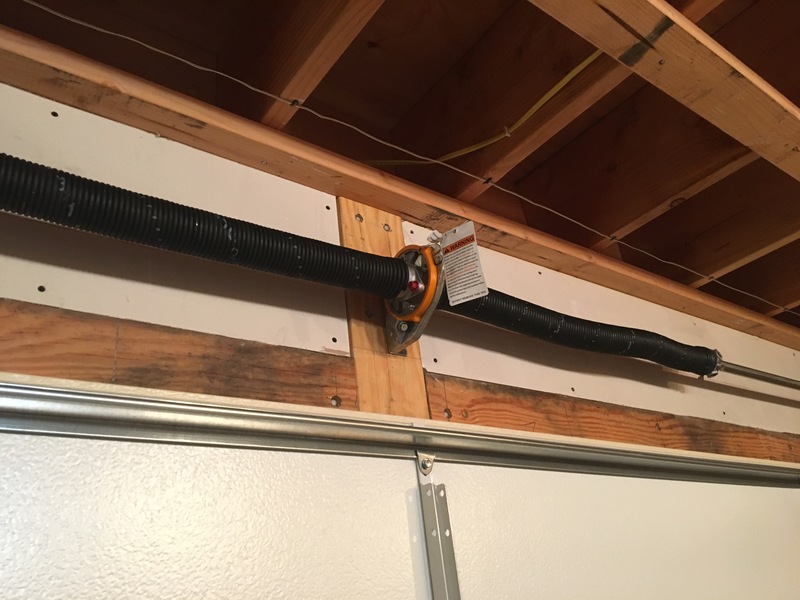 If you have a garage door with a torsion spring, this is the opener you want. Every door on the delivery truck had a corresponding Liftmaster 8500, so that’s what the pros are using. The opener mechanism is very compact and operates the door through the torsion bar. 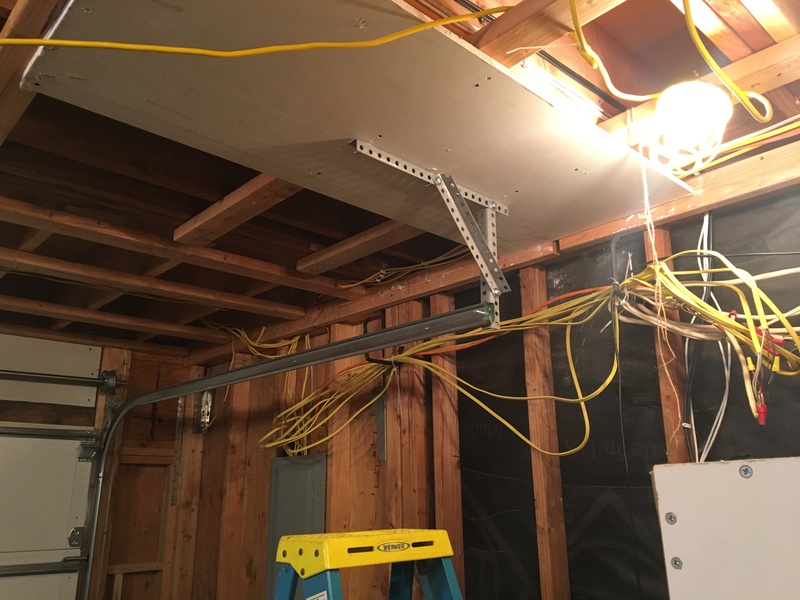 This design eliminates the bulky motor and bar in the middle of the garage ceiling. 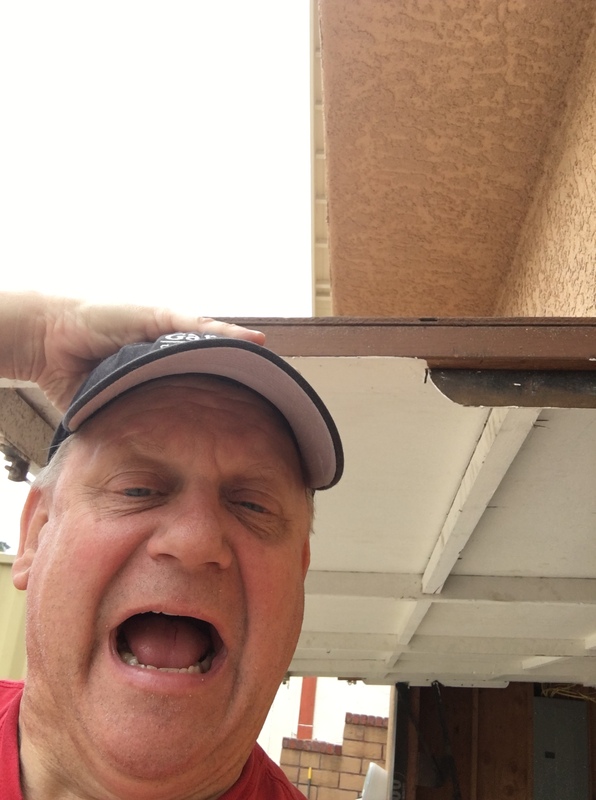 If you get a new garage door installed by a pro. it will likely come with one of these. The opener comes with an electric door lock. 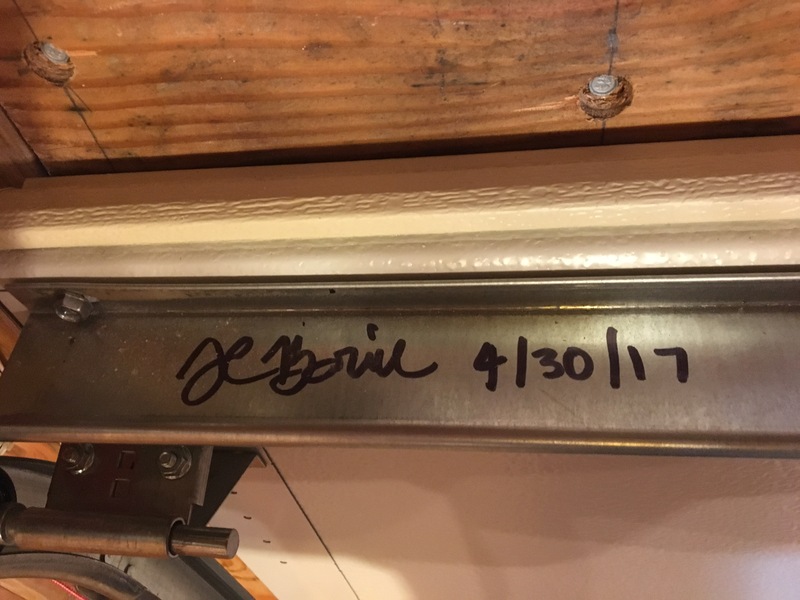 The bolt sticks through the track and prevents the roller from moving past it. Pay attention to how you install the light beam transmitter and receiver. Make sure you place the receiver on the opposite side of where the sun shines. If you install the receiver on the side which receives direct sunlight, as mine does in the late afternoon, then the sun will blind the receiver and the door won’t work. The receiver is the device that has what looks like a big glass eyeball. I thought it was the other way around until I installed it incorrectly and realized my mistake. This is the sender for the “light” beam that is a part of the door’s safety mechanism. It emits infrared light so you don’t see it. The amber LED shows that it’s on. This is located on the side of the door that gets sun in the late afternoon. This is the light beam receiver. It has a green LED and if it is lit, that means that the light beam circuit is working properly and that the door will operate (or if it doesn’t, then that’s not the problem). I found that the light beam is usually the cause of a door operating problem. Lookin’ good! I’m getting lots of compliments from my neighbors.